There wasn't as much time to spend in the kitchen today, so it was a night for a simple meal. I spent only about 15 minutes of my lunch break mixing the batter for the bread, the rest was easily prepared in the hour before dinner. In pondering these rules over the last few days, I stumbled on a NY Times article asking for readers' food rules. Michael Pollan's favorites of the rules submitted can be found here. Another great list of rules. Peel, core and slice apples and place in pan with cinnamon and water. Simmer for 30 min. Melt coconut oil in 350 degree oven, then mix with sugar. Add flour, baking powder, baking soda, and salt and mix again. Zest orange then squeeze juice from orange. Add egg and warm water then mix well. Stir in cranberries then bake at 350 for 50 min or until center is set. Coarsely chop potatoes and carrots. Pan fry vegetables with rosemary in olive oil for 10 min, stirring frequently. Add water then cover and simmer for 20 additional minutes. 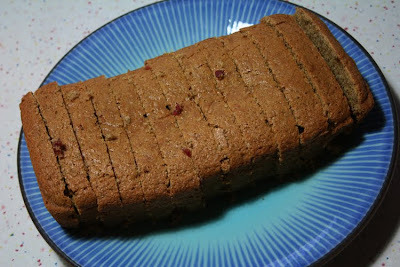 SHUT UP.....I just commented on our "like minds" on the Ugly post; then I hop over here and see cranberry orange bread. I was just looking for a recipe for this today, but they all used yeast. Wasn't willing to put the time into yeast so I gave up and here you are to save the day! 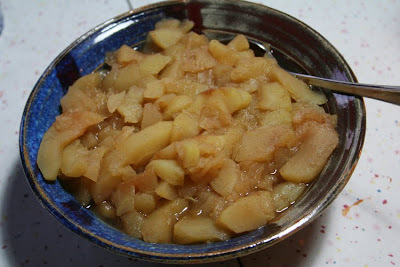 We had stewed apples last night....so yummy! oooh...hungry. 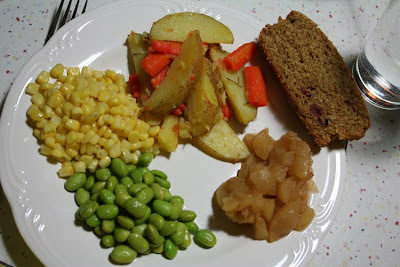 i just had a hankering for stewed apples! or baked--anything warm. love, love, love Michael Pollan. These are great quotes that you've chosen to highlight along with your terrific green posts. thx!